I spend a lot of time in the kitchen developing recipes. There are meticulous notes involved, multiple drafts and different coloured pens – the whole nine yards. But there is something magical about being in the kitchen and just throwing whatever you have together. While most of my time in the kitchen is spent working on recipes, I try to carve out a few times a month where I just go in there with nothing in mind and just throw whatever together. There are definitely some pretty big failures, but also some great successful dishes. That’s how this Quinoa Bowl came together. It was 11:30 at night and I needed something to bring to work for lunch the next day. I wasn’t looking to create a “blog worthy” dish, or follow a recipe, I was literally just throwing ingredients together. I had leftover zucchini, broccoli and kale in my fridge that needed to be used up. With the addition of a little Italian sausage, I had a meal ready to go in 15 minutes. Plus, I love when things are monochrome, so the idea of this dish having all green vegetables pleases my nerdy, uniform side. This Quinoa Bowl is the kind of thing that works well for a quick dinner, but I love to make a batch at the beginning of the week and bring it for lunch. In a small pot, bring water to a boil. Add quinoa and cover. Reduce heat and cook for 12 minutes. Meanwhile, cook sausage over medium-high heat, about five minutes or until fully cooked. Remove to a bowl and set aside. In the same pan, heat olive oil over medium heat. Add garlic, cooking for a minute or until fragrant. Next, add zucchini and broccoli. Cook for 4-5 minutes or until beginning to soften. Add kale. Cook for another 2-3 minutes or until kale has wilted. Finely, season with lemon juice and salt and pepper. 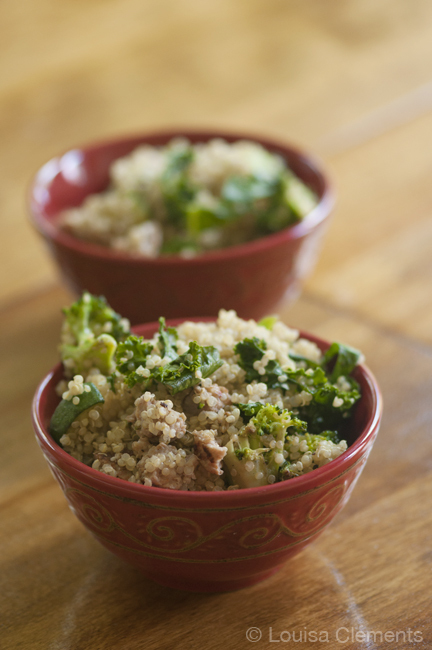 Toss vegetables with sausage and cooked quinoa. 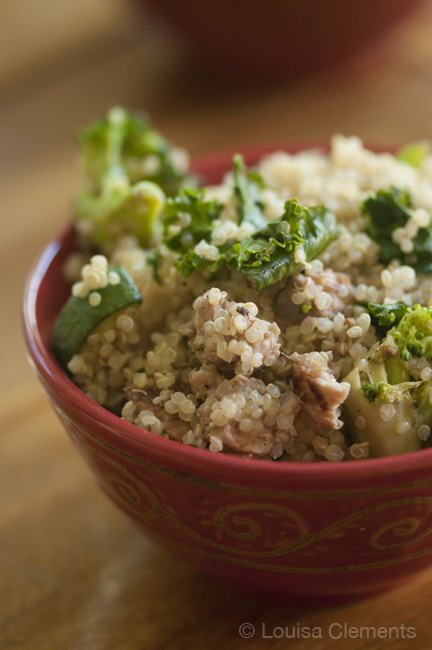 This Quinoa Bowl will quickly become a lunch staple. Thank you and so healthy. I've been eating quaker oats every morning with fruit, but I might change it up a bit. Have a great day! Hi Liz,I'm definitely on a healthy kick these days - let me know if you try the recipe!